If you know anything about Chicago-style politics — particularly when it comes to the open mayoral seat that is available for the first time in more than a generation — you know that having a consensus African-American candidate is important to many black Chicagoans. If you know anything about black America in general, you know that having a consensus within the African-American community (as we used to have on several key issues in previous times) is perhaps more important. And, as of yet, unattainable. If for no other reason than to highlight the macro issues inhibiting black unity and progress in 21st-century America, African Americans should treat the February 2011 mayoral election in Chicago as a national phenomenon. How Chicago goes is often the way black America goes. This week, Davis asked Bill Clinton not to campaign for Rahm Emanuel, lest the former president damage his relationship with the black community. And just last week, State Sen. James Meeks withdrew from the race, urging other black candidates to drop out and throw their support behind a single black candidate. "My friends, I come before you today to say that our city — and our community — is divided," Meeks said in a statement. "As long as our community remains divided and splintered — to the specific advantage of the front-running, status quo candidates — we will never see things improve. We need to speak with one voice." None of the remaining candidates took him up on it. Just as the search for a black "consensus" choice in Chicago along the lines of a Harold Washington has yielded little to date in the Windy City, in the same manner, we collectively fail to find consensus on the pressing matters that are affecting our communities at a crisis level. The failure to do so in Chicago at this time, perhaps, is troublesome, although restoring and uplifting struggling citizens of Chicago can still occur without the sought-after consensus. However, black folks nationally should glean a lesson from the consensus battle on the shores of Lake Michigan this winter, because unlike Chicago, black America whittles away viable opportunities for healing and advancement for itself and its youth without some consensus on priorities and methodologies to address the severe issues wrecking our families and neighborhoods. However, the more important lesson is that black America's one voice must be found within society — even if that "one voice" is made up of thousands of individual voices — and must be claimed immediately, even as we must also look to stop the bickering that seems to develop regularly within the community from well-intended debate. The emotional investment for African Americans nationally in the Chicago mayoral race is not about whether we will be able to place Chicago among the ranks of other major cities — like Philadelphia; Newark, N.J.; and Charlotte, N.C. — with African-American leadership at the very top. We risk a lot as a people when political and civic potential is not realized because our differences keep us more divided than united. If black political power remains split during this critical time in the Windy City — a town where black children are dying at alarming rates — the episode should serve as a model prompting us back to the bargaining and conversation tables throughout America so that we can resolve our differences, consolidate our priority lists and immediately concur on next steps. As with the mayor's race here in Chicago, the paralysis of analysis and inertia has resulted in a quagmire that makes good sound bites but keeps us stuck — in the past, in a confused state of division and in a rut. We in black America have more in common than we have differences. Our priorities lists (e.g., public safety, employment, education, family unity, health care) are probably similar. 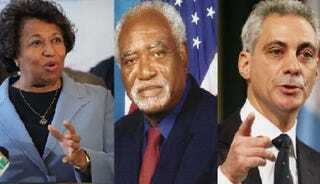 As with the movement to find black consensus in Chicago's mayoral race, there is a need to separate the wheat from the chaff when it comes to identifying the best political and civic leaders and ideas to remedy today's woes. Unlike the Chicago race, if we continue to follow the Windy City’s example and go without a black consensus on issues affecting us nationally, we will not have a chance to rectify the resulting societal carnage every four years. Lenny McAllister is a syndicated political commentator and the host of the morning radio show Launching Chicago With Lenny McAllister at 5 a.m. on WVON, The Talk of Chicago 1690 AM. He is the author of an upcoming edition of the book The Obama Era, Part I (2008-2010): Diary of a Mad Black PYC (Proud Young Conservative). Follow him on Twitter and Facebook.